On January 14, 1878, at about 10:00 in the evening, a span of the Tariffville Bridge gave way, plunging a Connecticut Western Railroad train into the Farmington River 20 feet below. The train included two locomotives and eight passenger cars packed with people. Many of them were returning from a revival meeting in Hartford where they had heard the popular Protestant evangelist Dwight Moody and singer and organist David Sankey. The accident happened ½ mile west of the Tariffville station as the first locomotive, having passed over the first half of the bridge, approached the western abutment. The span broke, sending the two engines (the Salisbury and Tariffville), the baggage car, and three of the passenger cars into the river. The accident killed 13 individuals and injured 70. The Western’s superintendent, Jonathan Jones, quickly returned to the Tariffville station and telegraphed the main office for help and within the hour an emergency train with doctors and medical supplies arrived. Jones also appealed for help to the Hartford Providence & Fishkill Railroad’s main office in Hartford, and it, too, dispatched additional doctors and rescue workers. Caleb Camp, president of Connecticut Western, also happened to be on the train as a passenger, and he sought help from local residents as other passengers rushed to the aid of the survivors in the icy water. In use for seven years at the time of the accident, the bridge was a Howe truss design built of wooden timbers and iron suspension rods with the two spans measuring 163 feet each. 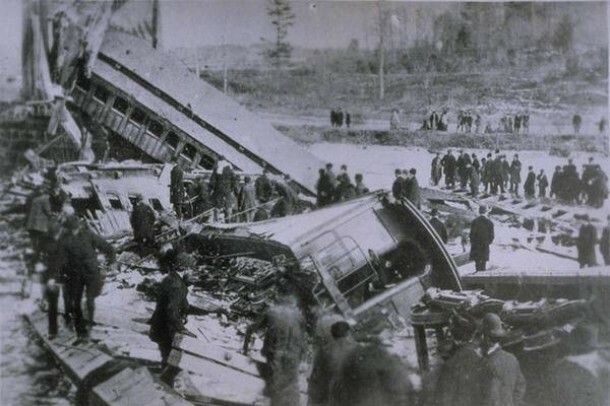 Immediately after the accident, many blamed the wreck on the weight of the two locomotives, which together weighed over 60 tons, being on the wooden structure at the same time—though this was not an unusual occurrence. At the inquest called in Simsbury to determine the cause of the deaths, bridge experts blamed the accident on a train derailment while railroad officials, of course, took the opposite side. They claimed that the bridge had been weakened and that its iron suspension rods had deteriorated. The jury’s final verdict ended up being split. The engines were eventually raised, repaired, and returned to service, and the bridge was rebuilt in the same design. The railroad, however, did not fare as well. It had been in a weak financial position before the accident and filed for bankruptcy by April of 1880. Prior to that, the company did compensate the families of the 13 people who had lost their lives. They paid out $200 to $600 dollars per death.